We were fortunate to be in area for the 2006 edition of the Swansboro flotilla and Christmas tree lighting. 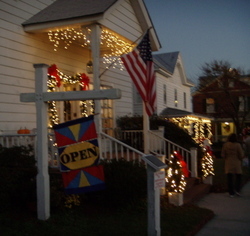 The streets of Swansboro were decorated for the holidays. There were luminaries all around Front Street and along the shores of the White Oak river. The weather had a pleasant chill to it, and a wonder crowd had gathered on the shores of the river. 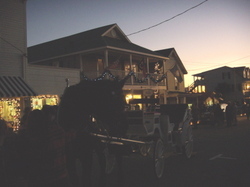 A carriage service was offering horse drawn rides around town. All the stores were open, and Jana's was even open into the evening. It was very pleasant evening as we stood on the shore waiting for the first of the boats decorated with Christmas lights. It took a while for the flotilla to appear, but they were well worth the wait. My vote would have gone to swimming sea turtle. Unfortunately moving boats in the dark are too much of a challenge for my pocket size Nikon. I guess the only way to really enjoy the flotilla is to be there. I understand there will be another one in Morehead City and Beaufort next weekend. I hope the weather is as good for their event as it was for Swansboro's. It really was a magical evening. We finished it off with a delicious seafood dinner at Captain Charlie's. I can highly recommend the fried oysters. Infact when christmas season we are really happy for that yearly celebration as well... were meeting our relatives friend an so on..